Until very recently my experiences with fishing have been practically non-existent. I have vague memories of fishing (or attempting to fish) in the small pond in my hometown. Most often I caught pollywogs and frogs by hand, which in my opinion was way easier than trying to hook a fish! Then there was the boat fishing done at Lake Isabella in CA where my grandparents lived, but my only remaining memory of those outings is choking on a trout bone — NOT fun — which effectively killed any desire for fish unless alive in a tank behind glass. Suddenly that has changed, thanks to my husband’s passion for the sport, and living in Kentucky where bodies of water are all over the place. Indeed, I have revived, or newly created, a passion for fishing! This passion led to a curiosity about the history of fishing as a sport, versus fishing strictly for food. Ready for some history? Large-scale fishing for food, whether commercially or for community survival, is a completely separate process than how a sportsman approaches catching fish for pleasure. One might think, as I did, that in ancient days leisurely sitting by a river casting a string in hopes of hooking a fish was far too unprofitable or wasteful of precious time to be done by anyone. Apparently, this isn’t the case. While undoubtedly the original purpose of fishing was for food, somewhere along the timeline man realized that the activity could, indeed, be fun and relaxing. Written references and drawings of people fishing with rods and simple nets are prevalent in ancient cultures. The earliest recorded fishing hooks were from around 7000 BC. One of the earliest tools discovered by archeologists is sharp pieces of bone, stone, or wood — called a “gorge” — used to hold bait and pierce the fish. With the later use of metals, hooks were fashioned, those unearthed not much different from those used today. Both gorges and hooks were attached by strings to flexible sticks of ever-increasing lengths as fishermen strived to ensnare the big fish further from the shore or deeper under the water’s surface. Ancient Egyptians used hooks and line to catch fish from the Nile River as early as 2000 BC. Many tombs have depictions of fishing with hook, line, and rod. The Chinese fished with hooks made from needles, line made from silk, and bamboo rods as early as the 4th century BC. Native Americans of the west coast were also known to engage in fishing with gorge hook and line tackle from about 5500 BC. The ancient Greek, Roman, and Macedonian civilizations used hook, line and rod tackle to catch fish. Homer wrote, in 800 BC, “Casting into the deep the horn of an ox, and as he catches each (fish) flings it up writhing.” and the Biblical book of Job mentions fish hooks also. Fishing as a true art form and leisure activity apart from the basic need for food gradually evolved, and not primarily in the western world. It is universally agreed that the first English book printed on fishing was Treatyse of Fysshynge With an Angle in 1496, written by Prioress Dame Juliana Berners as part of the second edition of The Boke of St. Albans, which had originally dealt only with hunting. Experts also agree, however, that it was not the first book on the topic (Manasollasa, for one, is a Sanskrit manuscript dating to 1127), nor even the first English language printing of fishing information, tracts and pamphlets alluded to in other writings. Solomon in his proverbs says that a good spirit makes a flowering age, that is, a happy age and a long one. And since it is true, I ask this question, “Which are the means and the causes that lead a man into a happy spirit?” Truly, in my best judgement, it seems that they are good sports and honest games which a man enjoys without any repentance afterward. Thence it follows that good sports and honest games are the cause of a man’s happy old age and long life. What is noteworthy is the emphasis a Treatyse of Fysshynge With an Angle gave to fly-fishing as opposed to bait-and-hook (or “lure”) fishing. The existence of ancient hooks and gorges might appear to indicate that they came before the invention of fancy flies. Yet, is this because delicate flies did not survive the destruction of time? No one knows for sure. There are references to “flies” scattered amid fishing writings in non-English dating well before, however, translations into English are sketchy, making it unclear if the “flies” are the same as noted in Berners’ Treatyse. All that can be deduced for sure is that when fishing made the transition from a survival to a leisurely activity, the use of individually crafted flies gained popularity. From there it was game on! Rods grew longer and longer, hitting lengths of 22 feet. Fancy and realistic lures, especially flies, were created. In fact, six of the dozen mentioned in the Treatyse of Fysshynge With an Angle are still in use today. Improved metals meant tougher hooks, while the study of fish species paved the way for specific designs. Charles Kirby, a London needle-maker, invented the “Kirby hook” in 1650, a distinctive shape commonly used today. The first edition of The Compleat Angler by Izaak Walton was published in 1653. Walton, and later on his friend Charles Cotton, continued to update the book for some 30 years. Considered the most famous piece of literature on fishing, The Compleat Angler was a scholarly work aimed to teach the sport, but also a charmingly written, passionate celebration of the English countryside and spirit of fishing. To date, the book has been translated and annotated innumerable times, republished over 500 times, and is the fourth most reprinted book in the English language, behind only the Bible, the works of Shakespeare, and the Book of Common Prayer. Methods for plaiting horsehair, gut, and other materials for stronger lines were continually tested. And, as lines became stronger, they too grew longer, reaching a length of 26 yards according to famed angler Thomas Barker in The Art of Angling published in 1651. Logically, the need to control so much line led to rings along the rod, and the necessity to easily reel all that line in. Who initially invented a reel for a fishing rod is unknown. Initially, reels (or ‘winds’ as they were known) were simply devices to store excess line, and probably not attached to the pole or with any sort of handle or mechanics to it. More than likely dozens of clever fishermen fashioned some sort of spool to wind the thread around long before anyone thought to patent it. Not until the early 1800s were “multiplier” reels invented, and it happened in America, specifically in Kentucky. Go Kentucky!! Surprisingly, it was watchmakers and jewelers who first invented complex reels. Their unique skills with cutting small gears and precision engineering gave them an advantage. These were the decades when fishing as a sport seriously took off. The demand for developing improved and wider ranges of fishing equipment escalated in line with the increasing passion for the sport. Ever seeking new challenges and better success, anglers’ wanted more. Clever inventors and modern technology — this was the Industrial Revolution years, remember — made it possible. Mass produced hooks, lines, rods, reels, and more became common. Imports of different types of woods for rods — such as Lancewood from the West Indies, Greenheart from South America, and primarily bamboo — had a huge impact. Fishing became a sport accessible to everyone. Equipment was plentiful and relatively cheap, certainly compared to many other sports. It was relaxing, as few sports were, could be enjoyed by men and women (although primarily a male activity until later in the Victorian era), and did not require physical prowess, youth, or superior intellect to excel at. Not typically competitive (except against yourself), fishing could be enjoyed alone or with companionship. The exclusivity of the English class system so attached to most activities of the day was not as obvious with fishing, although it did exist to some degree. Wealthy or poor, one could fish. The question was how one went about it and where. 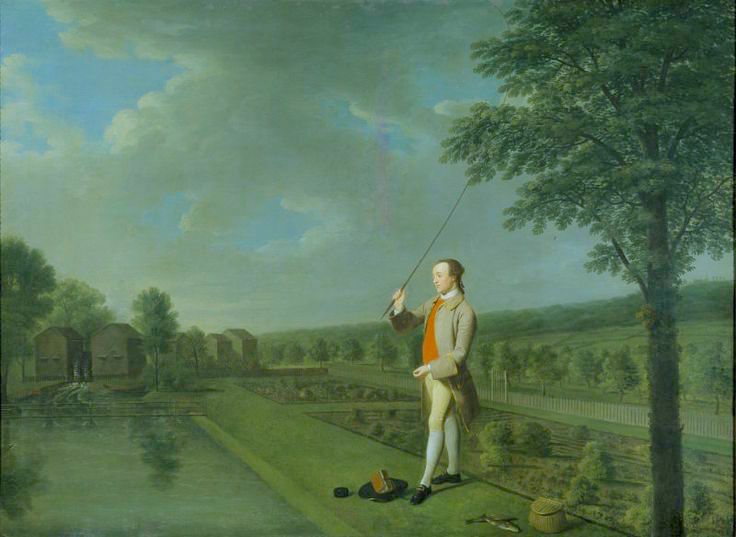 So while fishing was popular with all social classes, it tended to divide into “game” fishing for the tastier salmon and trout (primarily among the wealthy landowners with their private ponds), and “coarse” fishing for all other species done by the middle and working class Englishman. These divisions were reinforced in the mid-eighteenth century during rapid industrialization and urbanization when large numbers of workers took up coarse angling on the free, public rivers and canals. 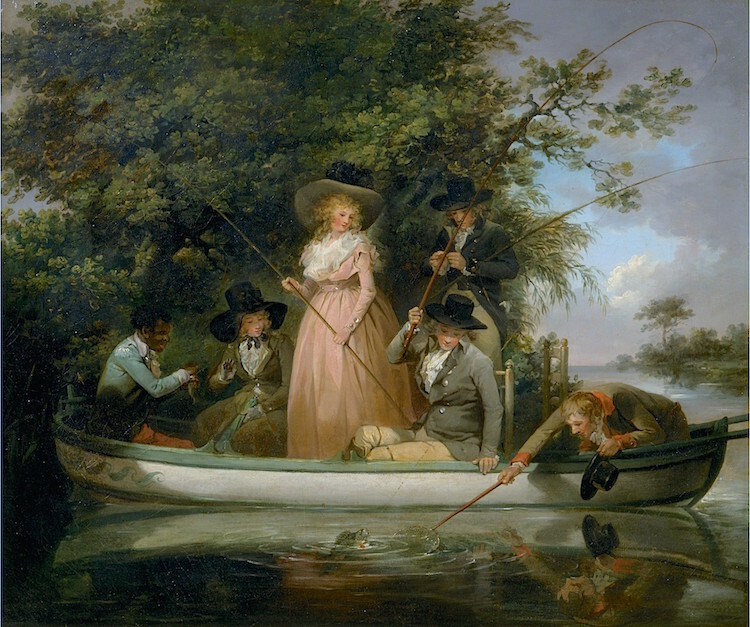 Sometimes the catch might be eaten, but coarse fishing was for sport and encouraged among the industrial workforce as more contemplative and civilized compared to other working class leisurely pursuits which often involved heavy consumption of alcohol. Another reason for the divide was time. The working-class man was less apt to have the free time to pass beside a lake or stream perfecting the art of fly-fishing. There is scant debate that pure fly-fishing was an upper class, gentleman’s sport, but this had more to do with the time required to develop the skill, the money to buy hand-crafted flies, and the access to pristine, well-stocked water bodies. Then, as it is today, fishing techniques were a personal preference. Not every man of the gentry was drawn to fly-fishing, nor was bait fishing with a hook considered “lowly.” Fishing was fishing, with skills necessary no matter what technique was used or species of fish caught. And if one was a true, passionate fisherman, a mysterious kinship existed that transcended class.